Rocket From The Crypt is my favorite band. All I know about writing about their records is to gush about how much I love them. Live From Camp X-Ray is another record of theirs that I love. It's short, but it's a powerful blast of rock and roll straight into my soul. It also has a special place in my heart as it I was involved in promoting it to college radio in a past life. I also promoted Group Sounds to radio when that came out, but I was a new member of the radio team at that time. While my Rocket tattoo was certainly used as a bargaining chip to help my company get on that record, I didn't have any contact with Vagrant and didn't have much to do with it on that side of the promotion world. (It's a weird thing, different promotion companies had to seek out record labels and convince them we were the best team to promote their record. It was an interesting part of the job). But I pushed Group Sounds as hard as I could to the radio stations I dealt with. My favorite part was convincing stations that they had to play it the week of my birthday that year. I got a lot of extra spins that week. What a bizarre job. By the time Live From Camp X-Ray was coming out, I had moved up the ladder and had many more labels that I was in charge of communicating with. The moment I heard a whisper about this new Rocket record, I was immediately on the phone with Vagrant trying to make sure we could be involved. There is no one who would have promoted this record to radio harder than I would, surely they would see that pretty quickly. For whatever reason, the dude that worked at Vagrant that was in charge of the promotion and hiring of indie promoters for radio was being difficult. I'm not sure if he was trying to get me to jump through hoops or maybe he just didn't like me, but he cat and moused me for weeks and weeks and just wouldn't give me any information or commit to anything. Around this time John Reis came to town to play a show. I actually can't remember for sure if it was a Rocket or Hot Snakes show (I could probably look it up and figure it out, but I need to finish this up), but it was definitely at the Bowery Ballroom. I searched him out (I had started talking to him recently so that my company could help promote the Swami records releases) to just get his ear about wanting to do the Rocket record. John was his usual super awesome self and said he'd put a word in. I consider myself truly lucky to have been able to work with him in any capacity and to have at least a tiny part in helping out some of my favorite records of all time. I went back to work the next day and did my weekly follow up call with the Vagrant dude and he reacted really negatively towards the fact that I had spoken to John and accused me of going over his head. I couldn't tell if he was joking or not but it was all very odd. Fast forward a few more weeks and I got a call from a different guy at Vagrant. He said the first guy was no longer with the company, the new guy (who I had actually known from other places) was taking over the promotion side for a bit and that my company was officially hired on Live From Camp X-Ray effective immediately. He gave me everything I needed and sent over an advance of the record and I've been listening to it constantly ever since. We had a nice little run with Live From Camp X-Ray and I consider it a highlight of my radio promo career. We made a photo copy of my Rocket tattoo and mailed it out along with the CD and the bio sheet when we sent the album out to stations. It was good times. 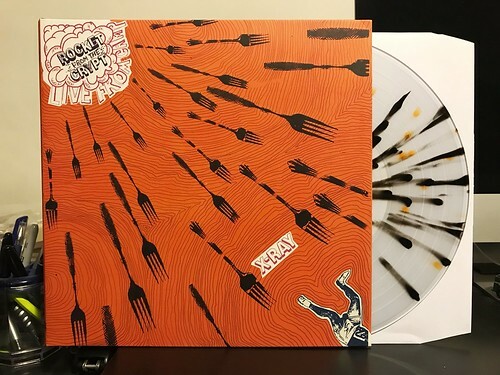 This newer repress is on clear vinyl with some black and orange splatter. It looks pretty good for a splatter, though that's not my favorite vinyl type. I would have gone with a black and orange split color, personally, but as always, I'm glad to add to the ever growing and apartment consuming Rocket From The Crypt record collection. Long live the dead. Just came across all of your RFTC posts and have to ask if you scored a copy of the Return To Monkey Island single? If so, can you describe the songs? I can’t find either song online and I’ve been very curious since hearing about it 3 months ago. Thanks. See minute 28 of this online radio show for “Waiting for the shoe to fall” https://subcity.org/shows/shakedown/0b666/ I’m still waiting for the bside to turn up. Tim: I came to find your blog while searching for Swami goodness as well. Keep up to good work; great post! Corner Boys - Just Don't Care 7"